At 15 months old your toddler is learning to explore everything around him, including food. Your child who ate anything as a baby may now refuse to eat anything you offer. During this time of discovering likes and dislikes, there are guidelines you should follow to make sure your child gets the calories needed for healthy growth and development. During your child’s first year of life, their growth rate was at its highest. Once your baby enters the toddler stage, their growth rate and energy needs are reduced. 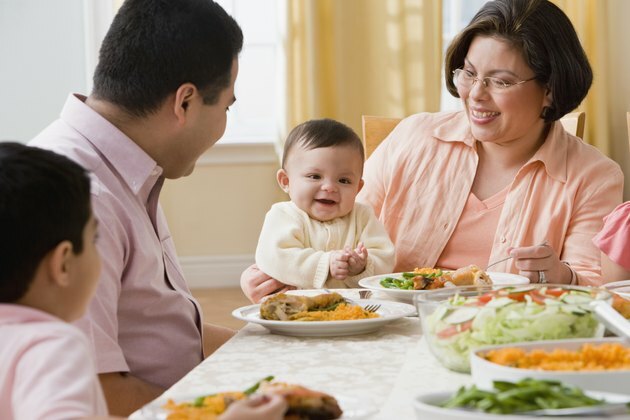 Toddlers need between 1,000 and 1,300 calories per day depending on their size, according to Keepkidshealthy.com. Your child should have no more than 16-24 ounces, or 300 to 445 calories, of milk per day, according HealthyChildren.org, a website of the American Academy of Pediatrics. The AAP also recommends no more than one serving of juice per day which will yield 60-90 calories. After drinking between 360 and 435 calories of milk and juice, only 600 to 950 calories remain to split across meals and snacks. To ensure proper growth and development, you should aim to feed your toddler healthy foods, and not restrict fats and cholesterol. Aim to provide meals and snacks that circle around the five basic food groups: proteins, fruits, vegetables, dairy and carbohydrates. One problem parents have is realizing what realistic portion sizes are for a toddler. The average toddler portion should be about one-fourth of an adult serving size. The only time you really need to be concerned is if your toddler isn’t growing as expected or isn’t as active as they should be.